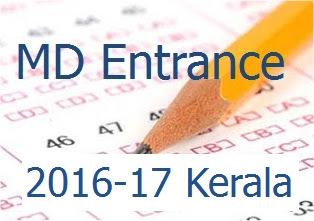 Applications are invited for the Entrance Examination for admission to M D Homoeopathy Courses for the year 2016-17 in the Government Homoeopathic Medical Colleges at Thiruvananthapuram and Kozhikode. Eligibility: Nationality - Indian Citizen. BHMS Degree (Direct/Graded) or its equivalent, declared thereto, by the Central Council of Homoeopathy. Age: Not be morethan 45 years Candidates who have completed the prescribed internship before the date of interview for allotment alone are eligible for admission subject to the condition that they should produce the Medical Council Registration Certificate at the time of interview for allotment. Candidates who have passed the final year examination with morethan three chances are not eligible for admission. The Provisional Rank list of General candidates who have appeared for the Entrance Examination for admission to Post Graduate Homoeopathy Courses 2016 conducted on 04.09.2016 at Thiruvananthapuram are published herewith. Dr. Bhavyasree B (Roll No.90228),Chittalakkottu Methal, Puthoormadam, Kozhikode has secured the first rank in this Entrance Examination. The Answer Keys to the questions were published on 05.09.2016. A few complaints regarding the questions / keys have been received and the same have been examined by Expert Committee constituted for the purpose. Based on the recommendations of the Committee, in Paper II, Question Number 88 changed as C. The Provisional Rank list of General Quota candidates will be available for reference in this office and on the website www.cee-kerala.org. Inclusion of a candidate in the rank list does not entitle him/her for admission to the courses, unless he/she satisfies the eligibility conditions contained in the Government approved Prospectus. The Principal and Controlling Officer, Government Homoeopathic Medical College, Thiruvananthapuram will make allotment and admissions as per the conditions laid down in the Prospectus.